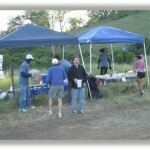 Volunteers are needed for course marking the day before the event, course monitors on race day and of course volunteers for manning the aid stations. Additionally, we will need volunteers to do the course sweep (removing ribbons and any trail markings) and a few runners to operate as safety runners (great way to see the course without racing!). 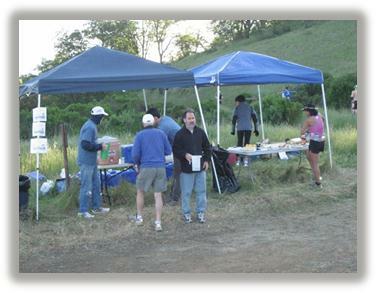 Join us for a ultra-party on a beautiful, Bay Area hillside…..the 2014 Almaden Quicksilver Trail Race is being held on Saturday, May 10th, 2014. The following is a volunteer call for all folks who enjoy giving back to their running community and just plain like having some fun with others out in the sunshine and nature! This day of racing provides volunteers a good opportunity to support all the runners in their hard-working efforts to run some beautiful, hillside trails and monster hills! The Striders will be manning the same aid station that we have for many years now, just with a “new and improved” location! We are now called the “Minehill Aid Station,” located approx. 1 ½ miles further up the hill from our former location. Yes, it is a bit of a further schlep uphill to get to our posting, but oh, what a view it’s gonna be! Wear your sneakers and get in a little trail hike! More details to be provided regarding this new locale in member emails and on this page. Please feel free to email us with any further questions about our new location and the access of it, using the contact us form at the bottom of this page. We are known for providing complete and cheerful support to the hard-working runners….several times for some of them running the longer distances. We prepare and serve a bunch of goodies runners are known to eat…fruits, sammies, the infamous boiled red potatoes and salt, lots of GU20, yummy stuff like this. Mike Florence is known to bring his famous “Jell-O shooters” which no respectable aid station would be complete without! The earliest shift will help to set up the aid station (pop-up shade awnings, food prep, lay out drop bags), the middle shift will provide replenishment of foods and GU20 drink and service the runners, and the late shift will continue to support the runners as well as help to break the station down after the last runner passes through. Each shift gets to support the runners one-on-one with filling water/GU20 bottles, encouraging them to eat our delicious offerings, finding drop bags and such. It is also fun to support friends and fellow club members who are running and give them a cheery “that a way mate!” as they pass through. Great photo ops, too! As a well-deserved reward to all volunteers, there is a tasty, quite amazing and free BBQ at the end of the race one can go to, a fun opportunity to congratulate your runner and all the folks that have worked so hard to complete challenging races (depending on when he/she finishes). We will go in shifts, the 7-11am folks going after their shift, and the 11-3pm and 3-7pm feasting before coming up the hill, as desired. The 11-3pm also has the option of eating after working their shift. Also, you will each earn a coveted and very cool Quicksilver T-shirt for giving of your time and effort that day…..a memorable keepsake to add to your probably already extensive collection! Please contact us (using the “Contact Us” form below) by Saturday, April 19th, with your enthusiastic commitment for one (or two or three!) shifts so that I can get this information to the Race Director promptly. He would like all volunteers to be able to wear their T-shirts on race day so that the runners can identify easier the folks that are out there to support them well in their efforts, so please include your shirt size with your reservation to help as a volunteer. Thank you much for considering being a very important part of this fun event. It is a great day and a meaningful way to give back to our running community. Please be sure to indicate which shift (or shifts) and what size T-shirt you would like.